Mallorquins, or Caballo Mallorquins, are a rare breed of horse indigenous to the island of Majorca in the Balearic Islands, from which it takes its name. They were first identified in 1985 by the Patronato para las Razas Autoctonas de Mallorca ('authority for the autochthonous breeds of Mallorca'). Mallorquin horses are listed in the Catalogo Oficial de Razas de Ganado de Espana in the group of autochthonous breeds in danger of extinction. Their status was listed in 2007 as critical by the Food and Agriculture Organization of the United Nations. In 2005 the number of Mallorquin horses recorded in the stud book was 247, but a census conducted by the Ministerio de Medio Ambiente y Medio Rural y Marino in 2003 identified only 172. 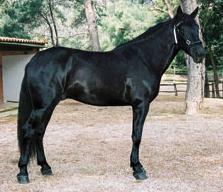 In some English-language publications, the Mallorquin and Menorquín are not listed, but horses of the Balearic Islands are merged into a grouping called the Balearic horse or Balearic pony. However, authoritative sources, including the Government of the Balearic Islands, the Ministerio de Medio Ambiente y Medio Rural y Marino of Spain and the Food and Agriculture Organization of the United Nations, make it clear that they are two separate breeds. For a horse to be registered Mallorquin it must be only black. There may be white facial markings, however, no white on the legs. Female horses must be at least 14.2 hands and males 15 hands. Their head is refined with a convex profile. Their neck is arched, their mane thick and short. Their bone structure is refined.